JetBlue is the latest airline to equip its cockpits with iPads, as it looks to cut back on heavy paper-based manuals that its pilots normally carry. Each JetBlue pilot will be trained to use three apps that are pivotal to their job – real-time weather, pre-flight planning and digital airport and aircraft charts – and the iPads will replace laptops and a “mound of paper manuals and charts”. JetBlue has previously embarked on a trial phase with around 60 pilots over a number of months, and is now in the process of dishing out a fourth-generation 16GB WiFi iPad to all 2,500 pilots. The airline says it has been approved for many years already to use a PC-based laptop in the cockpit – called an Electronic Flight Bag (EFB). But the iPads will bring in new capabilities, especially as it’s about to roll out Ka-Band satellite Wi-Fi in its planes. Indeed, online access means pilots can download weather imagery, and also access updated flight documents much more quickly. 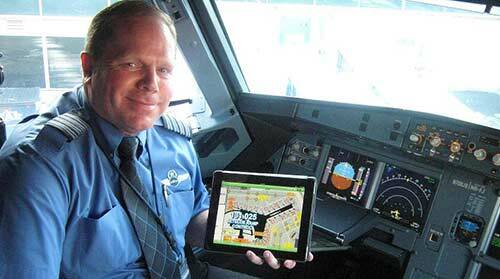 JetBlue serves almost eighty destinations across the US, Caribbean and Latin America, but it isn’t the first airline to introduce iPads into the cockpit. United Airlines jumped on the tablet bandwagon way back in 2011, which was followed by British Airways. American Airlines, on the other hand, became the first to get FAA approval to use iPads in ‘all phases’ of flight last year. “Pilots will be able to make decisions to help improve the customer experience, such as having a more robust weather briefing that can be used to update customers during the flight about what to expect en route,” adds Martin.